How many steps is required for moving a Knight from (0, 0) to (tx, ty)? Minimal steps needed to move a Knight from (0, 0) to (tx, ty). A018837: Number of steps for knight to reach (n,0) on infinite chessboard. 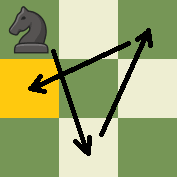 A018838: Number of steps for knight to reach (n,n) on infinite chessboard. A065775: Array T read by diagonals: T(i,j)=least number of knight's moves on a chessboard (infinite in all directions) needed to move from (0,0) to (i,j). 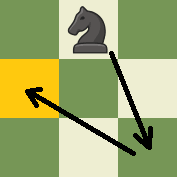 A183041: Least number of knight's moves from (0,0) to (n,1) on infinite chessboard. Saved 2 bytes thanks to Mathe172. Inspired by the formula given for A065775. Slow as hell for (not so) long distances. We define z as the bitwise OR between x and y. While we have z > 1 (which means that either x or y is greater than 1), we recursively try the two moves that bring us closer to (0, 0): f(x-1, y-2) and f(x-2, y-1). We eventually keep the shortest path. x & y == 0 and x | y == 0 means that we already have x = y = 0. Thanks tsh for -11 bytes! How could I come up with this!? 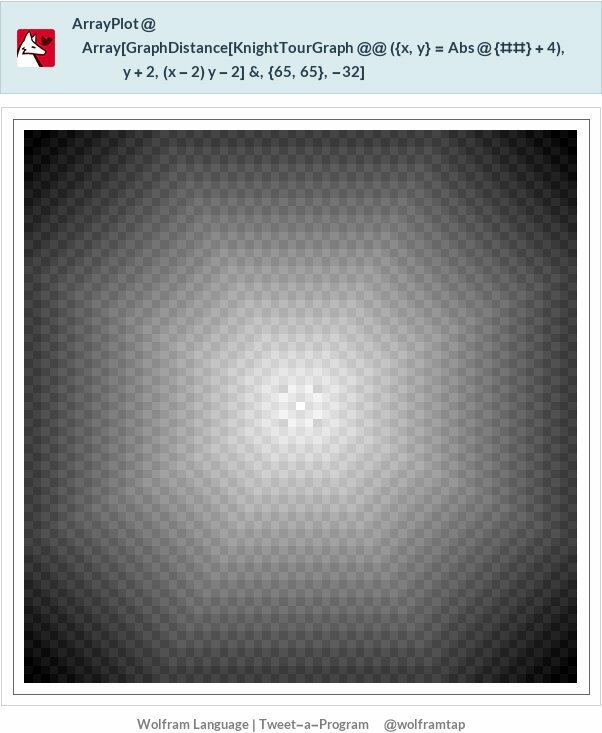 Assumes that the whole board is colored in the checkerboard pattern (that is, cells with x+y odd and x+y even are colored with different colors). The parity of the number of steps must be equal to the parity of x+y. Assumes the knight starts from coordinate (0,0), and have moved n steps, and is currently at (x,y). For simplicity, assumes x ≥ 0, y ≥ 0. Since each step x increases by at most 2, x ≤ 2×n. Similarly, y ≤ 2×n. Since each step x+y increases by at most 3, x+y ≤ 3×n. It turns out that a(x,y) = round(0.4 + l(x,y)) is a good approximation to n.
x == 1 and y == 0 or x == 0 and y == 1: The algorithm incorrectly returns 1 while the correct answer is 3.
x == y == 2: The algorithm incorrectly returns 2 while the correct answer is 4. So, just special-case those. Add the result by 2 if the value of x and y are one of those. Takes input as a complex number z = complex(tx, ty). Input is a complex number with integer real and imaginary parts. The code is very inefficient. Its memory requirements increase exponentially with the output. It times out in TIO for the test cases with output exceeding 7. Takes the input as a singleton list of pairs of numbers. A simple brute force. Needs a lot of time and memory for results > 8. Starting with a single element list of coordinates (the input), repeatedly add all positions that can be reached for every element until (0,0) is in this list. Keep track of the recursion level and return it as the result. Edit: -7 bytes thanks to @Lynn. All squares marked + can be determined by moving directly towards the origin and then recursing. Very slow; times out on TIO for outputs over 6. Takes a complex number as input. The code uses complex numbers because it was shorter in an intermediate step and it also seems a lot faster; you could also use pairs by removing Æi and replacing 0 with 0,0 on the second line. 1,-pḤµ;UÆị    Helper link. No arguments. 1,-             Get the pair [1,-1]. Ḥ           Double each to get [2,-2]. p            Cartesian product: get [[1,2],[1,-2],[-1,2],[-1,-2]]. µ          Start a new chain with the list of pairs as argument. ;         Append the reversed pairs to the list. Æi      Convert each pair [real,imag] to a complex number. ¢            Call the previous link to get knight moves as complex numbers. yield 8^n tuples containing move sequences. S€         Sum each move sequence to get the resulting square. i      Find the target squares (1-based) index in the results, or 0.
ç        calling the previous link results in a nonzero result. Not the answer you're looking for? Browse other questions tagged code-golf integer graph-theory chess or ask your own question.